So I know I have mentioned this box in the last few podcasts and I kept promising to post some details about it. So here we go. First the design. I picked up some origami paper while on vacation this past August and was envisioning a small box with a Shoji screen top where light could filter through the thin paper. I sketched out some ideas but was most concerned with the durability of such a design. Origami paper is much thinner than typical japanese paper used for Shoji and would tear quite easily. A few weeks earlier I was having lunch with a client at one of my favorite sushi restaurants and they were serving food in long and thin Bento boxes. That got me thinking so I hit some of my favorite design idea sites and came across this design on Fine Woodworking that Gary Rogowski build a few years ago. After getting over my disappointment that I yet again did not have an original thought and someone had already built something I was thinking about, I decided to set to work and see how I could make it my own. The great thing about this design is how little wood you really need to put it together. 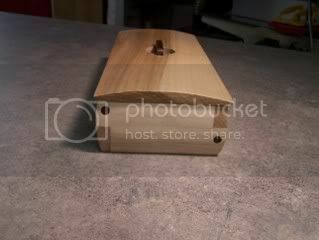 Here are all the parts minus the plywood bottom and walnut handle. 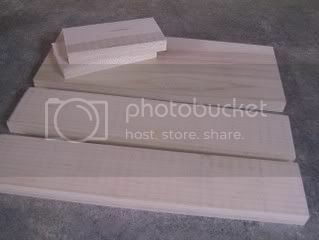 The sides are 1/2″ thick and I cut all of these pieces out of a 1 1/8″ thick piece of maple that was just over 10″ long. After resawing to thickness I had enough to rip the sides out and the top. I marked out the half lap joints so that they alternate all the way around the box and then routed an 1/8″ groove for the bottom panel. I cut the half laps on the table saw with miter gauge and tenon jig. 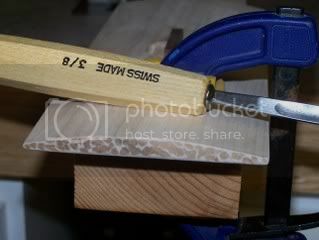 You could also cut them with a dado blade but I find I spend less time cleaning up the fit using the tenon jig method. I cut them a little oversize and then refined the fit using a chisel to pare away the excess. 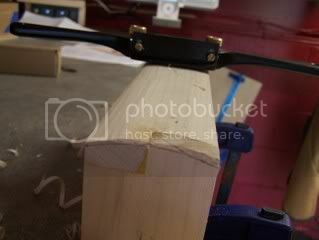 With the joints alternating the clamp up is a little more difficult and takes a few more clamps than you would think. 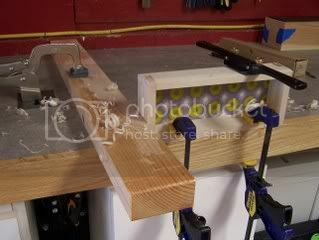 Even with the extra clamps be careful that you keep the box square. 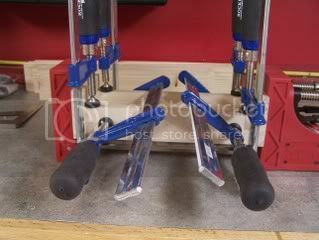 I had to adjust several times to get it just right and a dry clamp is definately required to get it right. 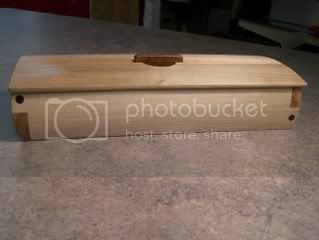 While the box was in the clamps I routed a rabbet on the bottom of the lid to fit into the box and then drew the curve of the top onto the edges. 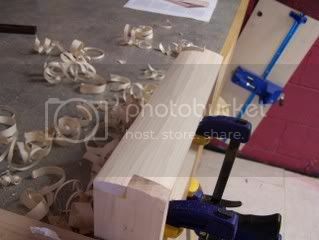 The lip formed by the rabbet added a convenient way to clamp the top in place and I used my block plane to form the curve. Make sure you drill the hole in the top before shaping the lig or it can be harder to drill into a convex surface. 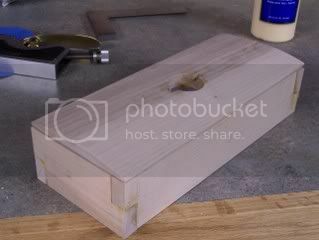 Now I used a shoulder plane to trim the rabbet on the bottom of the lid to get a perfect snug fit onto the box. A very nice fit, now to shape the box body. I drew on the curve on all four corners, clamped a batten to the countertop, and clamped the box down so I could shape the curve using a spokeshave. 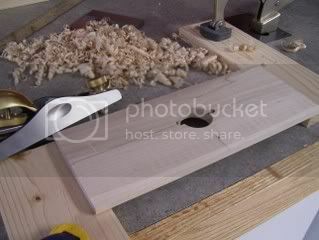 You could also shape the sides using a block plane but I find the work goes faster with the spokeshave. The ability to push or pull the shave allows you to deal with the end grain on the half laps without chipping out the corners. Once you have the shape roughed out you will get a slightly faceted look. From here grab your finish spokeshave or adjust the cut on your shave to a lighter cut and refine the facets into one continuous curve. In Gary Rogowski’s design he uses brass pins to reinforce the half laps. I chose to use walnut dowels instead. I have a Miller dowel mini bit and some walnut miller dowels that work perfect for this application and will make it infinitely stronger than just plain dowels. 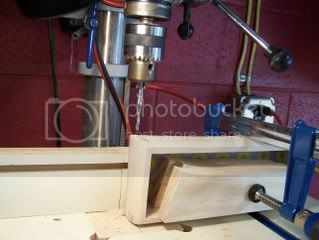 Make sure you clamp the box to a fence on the drill press because you are drilling into a curved surface. I chose to drill after shaping the side so that I could more accurately place the dowels in the center of the joint and it was hard to tell before the cutting the curve. 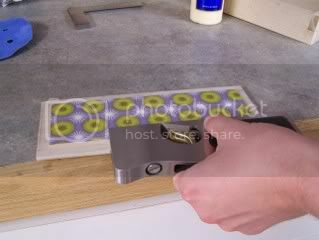 It also makes dealing with the end grain easier to flush cut them later. Now I routed a 1/4″ groove on either side of the hole in the top and then squared up the ends using a chisel to fit the handle. 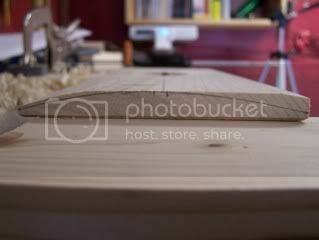 Finally as an extra touch I used a carving chisel to texture the ends of the lid. After 5 coats of a Watco spray lacquer here is the finished product. The origami paper is held in place with a coat of polyurethane used as glue. This post skips over a few points but I learned some interesting lessons on this simple box regarding keeping your project square and fixing it when it slips out. I also learned a lot about lacquer and fixing spray mistakes when the humidity climbs and temperatures drop. I think I’ll save those topics for another time and just celebrate the completion of this project. I will definitely make more of these.